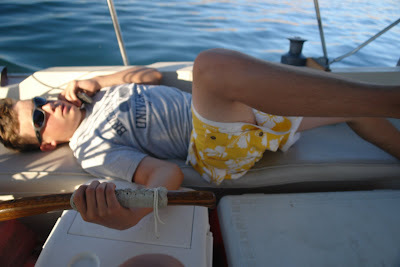 The northerly wind meant a long day of tacking, but no one seemed to mind. Although our goal was to reach Fremont Island, some 20 or 30 miles to the north, we were in no hurry. As every sailor has discovered, in a powerboat you may get there faster, but in a sailboat, you are already there. 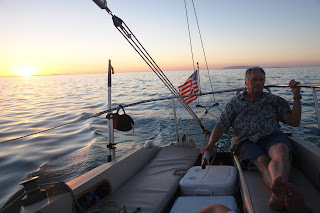 It was my Dad's first trip on a sailboat, and we all enjoyed watching him learn the ropes. Lesson #1 was that the sails do not steer the boat. A sailboat can sail almost any direction except directly into the wind. The sails create an airfoil shape, actually pushing and pulling the boat along in the wind. The keel converts this force to forward motion, and the rudder provides steering ability. So Grandpa took the helm and within a few minutes learned the fine art of watching the wind vane to determine wind direction, and listening for the luffing of the sails to determine when the boat was pointed too close to the wind. (When sailing almost directly into the wind, the sails will lose power and begin flapping, or luffing, in the wind. At this point they are not providing forward momentum.) He was a natural, and guided the boat along many, many miles of our voyage. We took very long tacks, and turns at the helm, which left plenty of time to site and talk or even take naps as the boat sailed quietly, quickly along in the sun. This was our first trip with the new Bimini, and the shade was terrific. The Bimini is 6' long - as long as it can be without running into the boom sheets at the aft or the cockpit. To shade the helmsman, we attached a large towel to the bimini and stern pulpit. 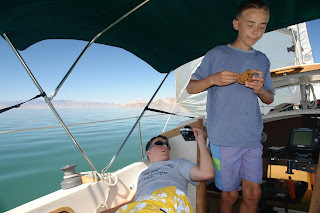 The temperature in Salt Lake City today was 100 degrees, but out on the water it was 10 degrees cooler, thanks to the cooling effect of the wind on the water. After coming with 2 miles of Stansbury Island, we tacked and headed back towards Antelope island. I'd been told that the wind could likely completely die off sometime between late morning and early afternoon, however we were fortunate, and the wind kept blowing throughout the day. It certainly slowed for a few hours, but we still averaged about 4 1/2 miles an hour most of the day. 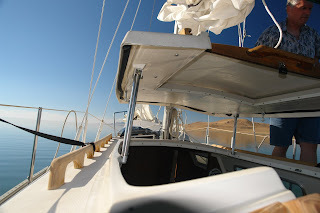 We reached Antelope Island's Split Rocks bay, and then turned westward again. The wind had shifted slightly, so we sailed toward Carrington Island, north of Stansbury Island. The greatest challenge of the day confronted my eldest son, who at some point on this tack lost cell phone reception. It was truly devastating, because he could no longer receive text messages from his friends. (Why doesn't AT&T put cell towers on the (uninhabited) Great Salt Lake islands...) He was not to be outdone however, and kept trying throughout the day. Here is a picture of a pose he mastered. Laying on his back, he could doze while keeping an eye on the windvane and with his free hand, occasionally check for reception. Incidentally, he holds a Basic Keelboat ASA certification, although this particular feat ought to earn him an honorary Helmsman's Technical Communications ASA certification, if such a thing becomes available.